Boston Massacre is a lithograph from J. H. Bufford’s (1810- 1874) lithography company in Boston, based on an illustration by W. L. Champney. 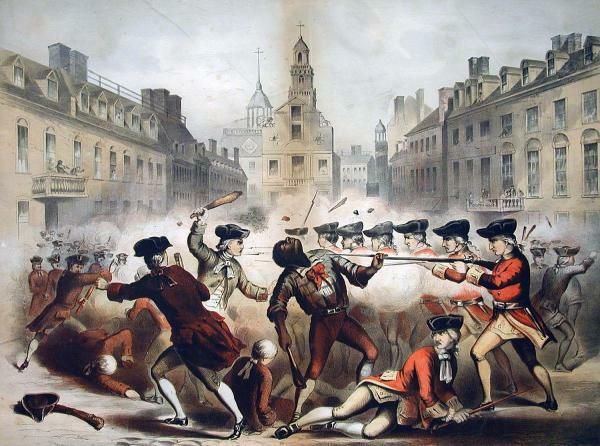 This version of the Boston Massacre has one major difference from previous renditions of the event: it includes Crispus Attucks and portrays him as a central figure of the event. It is possible that, because this print was published in the 1850’s during the abolitionist movement, artists may have been more sensitive to representing blacks in their art. (4) Groce, George C. and David H. Wallace, The New York Historical Society’s Dictionary of Artists in America, 1564-1860, New Haven: Yale University Press, 1957. pg. 118.